Irrationally excited for the return of Twisted Metal to the PlayStation? The PS3 sequel won't be out until some time in 2011, but United Front Games' ModNation Racers is going to make the wait slightly easier. Mr. Tooth will be joining the list of paid and fully authorized racers in the "Play. Create. Share." PS3 game this week, costing a cool $1.99 USD. 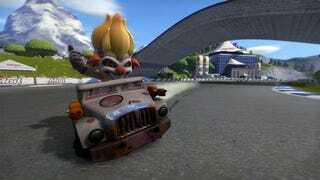 The murderous clown joins fellow PlayStation properties God of War, Uncharted and Ratchet & Clank in the do-it-yourself kart racer, his evil ways made cuter.